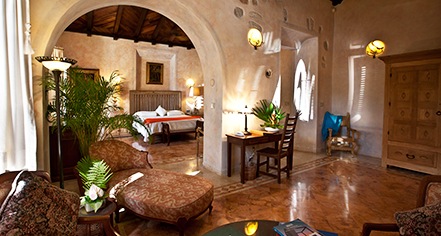 Hacienda Xcanatún features 18 marvelous guest rooms for its visitors to enjoy during their time in Mexico. With a range of accommodation tiers, guests can enjoy a space that matches their own unique preferences. The property offers guest rooms and suites for added comfort, for parties looking for more expansive accommodations. 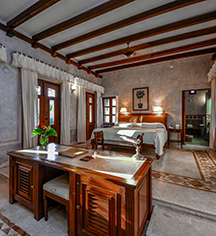 Guestrooms - With comfortable furnishings and spacious interiors, each guestroom affords matchless luxury within the Yucatan region. Suites - Each Suite boasts one-of-a-kind design accents including authentic furnishings, locally-sourced artwork, and more. Hacienda Xcanatún, a charter member of Historic Hotels Worldwide since 2015, dates back to 1789.